Today we are going to explore the way post-its can celebrate student learning, while also holding students accountable for the work you have been teaching and charting in your classroom. We first saw this idea in an earlier post (The Seasons, and The Charts, Are Changing) as a way to support children as they move through the writing process. 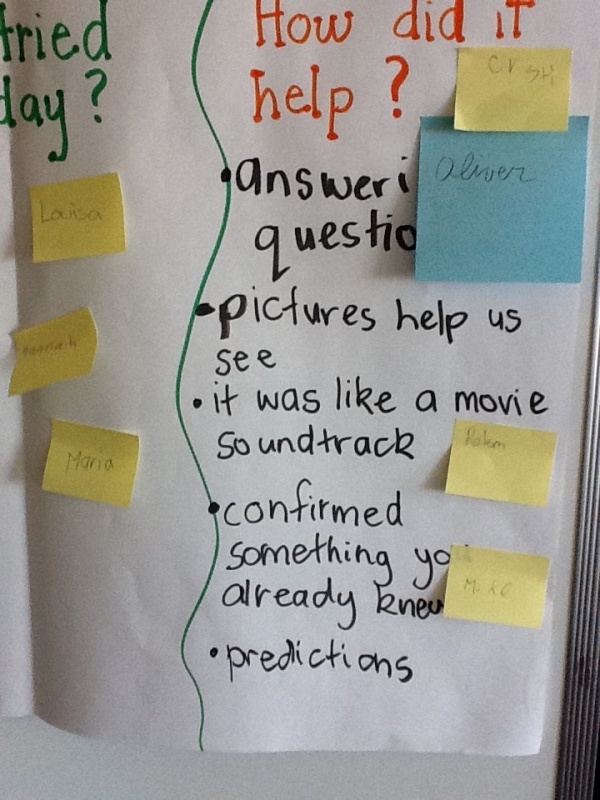 The post-its are a concrete, physical way for children to interect directly with the chart and begin to internalize the learning that is taking place. The following examples look at variations in reading and in writing. 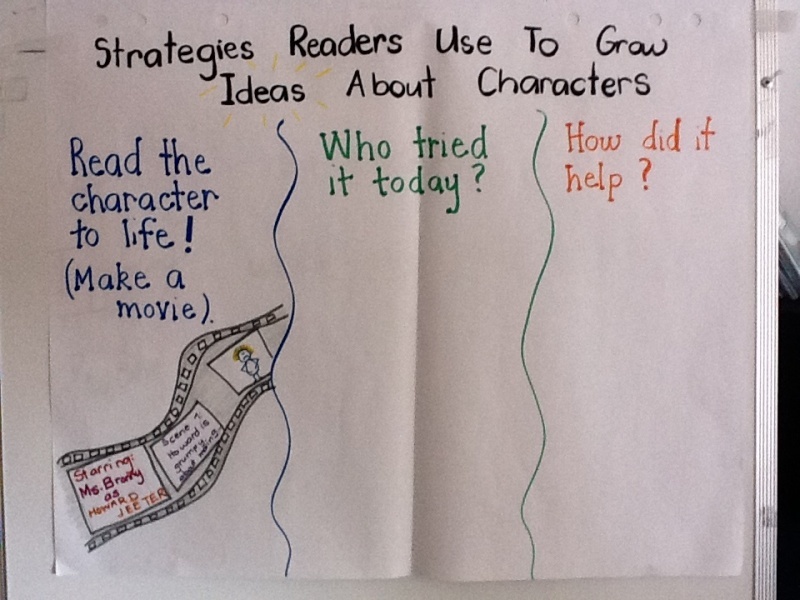 This chart shows a strategy to help first grade readers read longer (We can read looong and strong!). The steps are clearly set on the left, and a teacher sample from the minilesson is on the large green post-it in the middle. The students set their own goals (ranging from 3 to 10 to 110) and then set off to read, with their goals in mind. As the teacher conferred with children, she was able to use these goals as an entry way into a conversation about each child’s reading. When the class reconvened for the share session at the end of the workshop, the students reflected on what they had accomplished. Many had met or beat their goals and the post-its were put on the chart to celebrate. For the few over ambitious readers, they revised their goals to more realistic ones, once they saw that this was not just some pie-in-the-sky enterprise. The teacher’s plan is that the next day these post-its can be used to set new goals in the interest of increasing stamina, volume, and engagement in her young readers. BONUS: This next set of pictures is from a fourth grade classroom! This chart comes courtesy of Bronny Roberston, an incredible literacy coach at an American school in Bucharest, Romania. Bronny was teaching fourth graders about the important work of visualizing your character as you read. 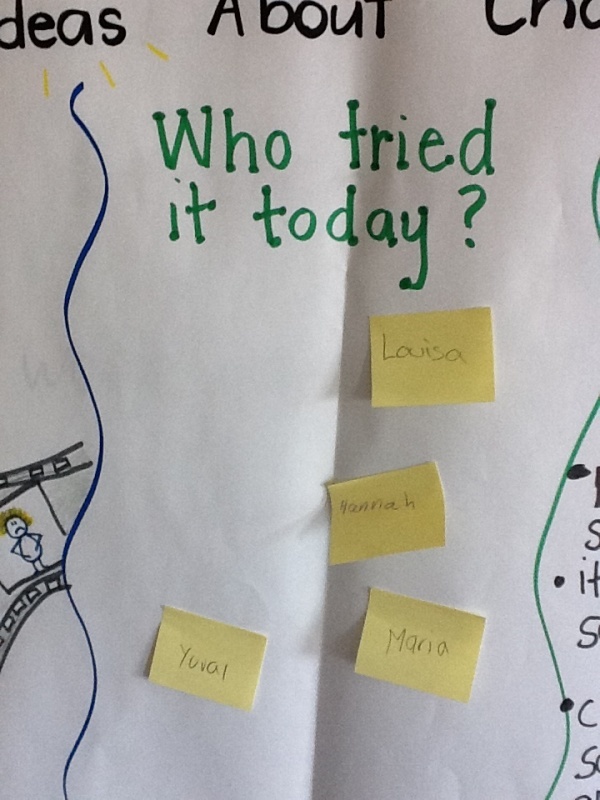 The interesting thing here is the way she held students accountable for trying the strategy by post-it-ing names under “Who Tried It”. When we teach a workshop and we offer an invitation to try something, it sometimes feels as though no one ever does…. Bronny has celebrated the children who took on the work she taught, therefore inspiring others to do the same. In the final column she gives a purpose to doing this work. Rather than telling the children outright what to say and how to say it, she let them explore the strategy, and then took their language as a way to explain to others why you would want to use this strategy. Using children’s language is always a smart way to make charting stick. 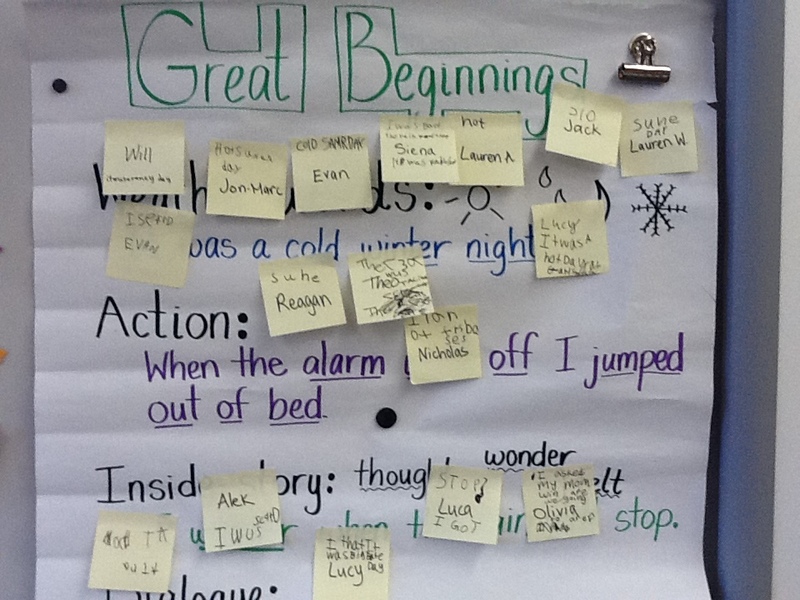 Jess Greer, an incredibly lovely and thoughtful first grade teacher in Orinda, California, took the post-it approach to help writers name what kind of writing work they had been doing. 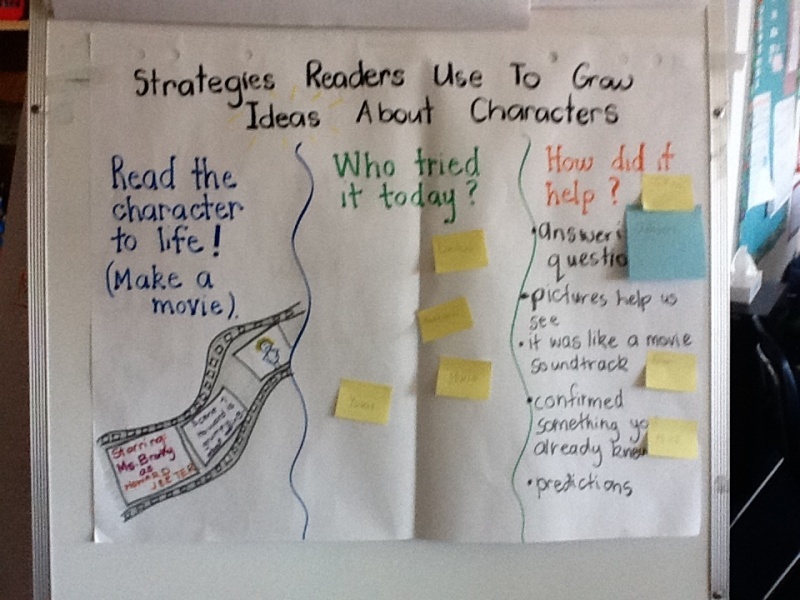 Jess taught several ways to start a story and children post-ited the ones they tried. Jess can take one look at the chart and VOILA! ready-made small groups! She can gather children who started with action and think about how they can make that work even stronger. She can also use the children’s post-its to see which craft techniques no one is using and go back to reteach these particular strategies. After teaching several strategies, it is a smart move to ask children to reflect on which ones they often use and which ones they rarely use. This will help you reflect on your teaching, and help students reflect on their learning. Enjoy exploring the use of post-its on your charts as a tool for accountability, self-reflection, and independence, and let us know how it goes. Until next time, happy charting! I love the idea of having students interact with the mini-lesson strategies by placing post-its on the chart when they’ve tried them! Now, I don’t have to read every single notebook to see who tried what – I can simply call them back to the carpet and discuss what’s on the chart! Brilliant!! I love these charts. The more kids interact with the charts in the room, the more they own them and will use them…and isn’t that the point!? A wonderful teacher at PS 277 has started a “jot lot” in her fourth grade classroom. At the end of each workshop, students place one post-it that represents their work during that workshop toward their individual goal. Kristin can quickly skim them to help her plan for her instruction the following day. No more wondering what’s on those post-its. This is also a great technique to assess students’ ability to be metacognitive — do they know the work they’re doing? Can they name it? Can they show it? THANKS FOR CONTINUING TO INSPIRE! Can’t wait for your book. You showed a chart on Sat. that was titled, “Readers Make a Movie in our Minds” It started with ” What is my character doing?” and “What does my character look like?”. It had some great ideas, but I only saw it for a moment. Could you post it on here so I can take another look? Great workshop. I am looking forward to your book.